Roasting is an easy and healthy way to bring out the best in any variety of vegetable and can even coax a drab winter tomato out of hibernation. Fruity olive oil or neutral sunflower oil and a pinch of salt turn the dry air of your oven into a super flavor conductor, caramelizing and concentrating the juices within the vegetables. Gnarly celeriac, earthy rutabagas and snappy carrots melt into a naturally sweet, almost candied version of themselves, without an ounce of sugar. Oh, and tomatoes! If you find yourself with those drab, winter tomatoes, roasting will transform them into sweet and savory jewels. Root vegetables will take longer to cook as compared to something softer such as zucchini or eggplant, but all should be roasted in the same 400 degree F oven with varied times. Preheat oven to 400 degrees F. Place beets and olive oil in a roasting pan and toss with a spoon or spatula to coat. Season with salt and pepper and roast for 25 minutes. Remove pan from oven and gently turn the beets over in the pan. Return pan to oven and continue to roast for another 20 minutes or until the beets are tender and slightly crispy on the outside. 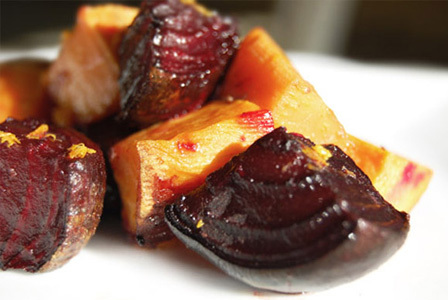 Add the orange zest and transfer the beets to a glass or ceramic serving bowl. Refrigerate until cool, about two hours. Sprinkle with about one tablespoon of freshly squeezed orange juice, or to taste. Season with additional salt to taste. Preheat oven to 400 degrees F. Place tomatoes, eggplant, zucchini and olive oil in a roasting pan. Season with salt and pepper. Toss to coat with oil. Place pan in oven and roast 20 minutes. Using a large spatula, gently turn the vegetables and roast for another 20 minutes or until caramelized and tender. Remove from oven and add the shallot. Set aside. Cook pasta according to package directions and drain well. Place the cooked pasta in a large serving bowl. Add the vegetables and all of the pan drippings/oil to the pasta. Add the oregano and gently stir to incorporate. Add salt and pepper to taste. Serve warm or chilled with additional fresh oregano.